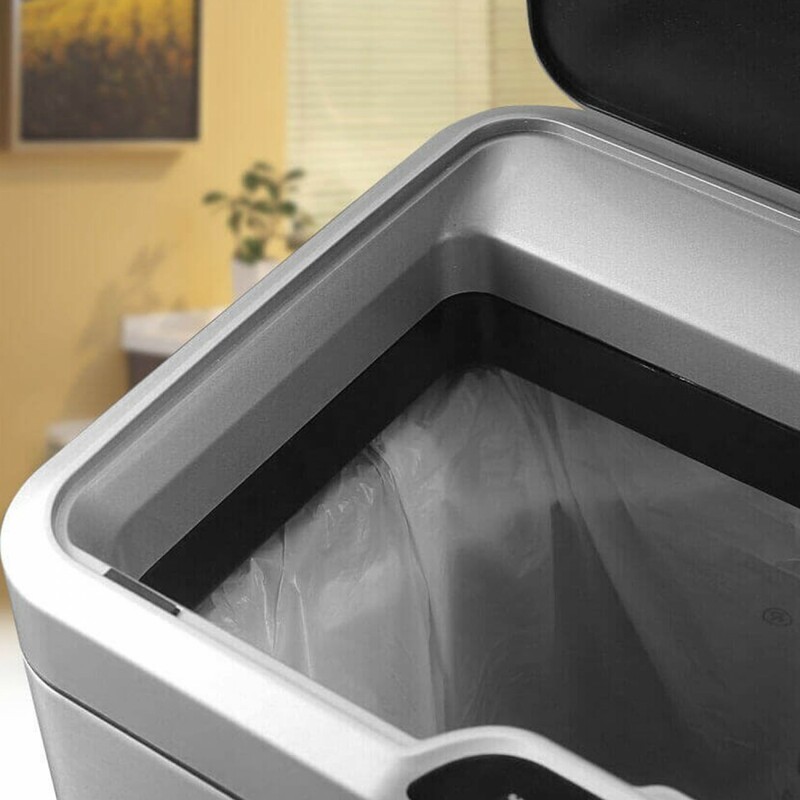 This 40 Litre EKO double compartment kitchen bin has a minimal, smart solid stainless silver steel body with a fingerprint proof finish concealing two x 20L inner buckets, making it an ideal kitchen bin for sorting out your waste recycling quickly and easily. The durable black plastic intelligent sensor lid opens with a wave of your hand and closes automatically when you leave. It has a stay-open capability for easy liner changing. You can also operate the lid with buttons on the front digital touch screen panel. The Mirage has been cleverly designed in a space-saving efficient shape and, at 27cm deep, this bin should tuck away discreetly. The lid opens vertically and will not hit the wall. 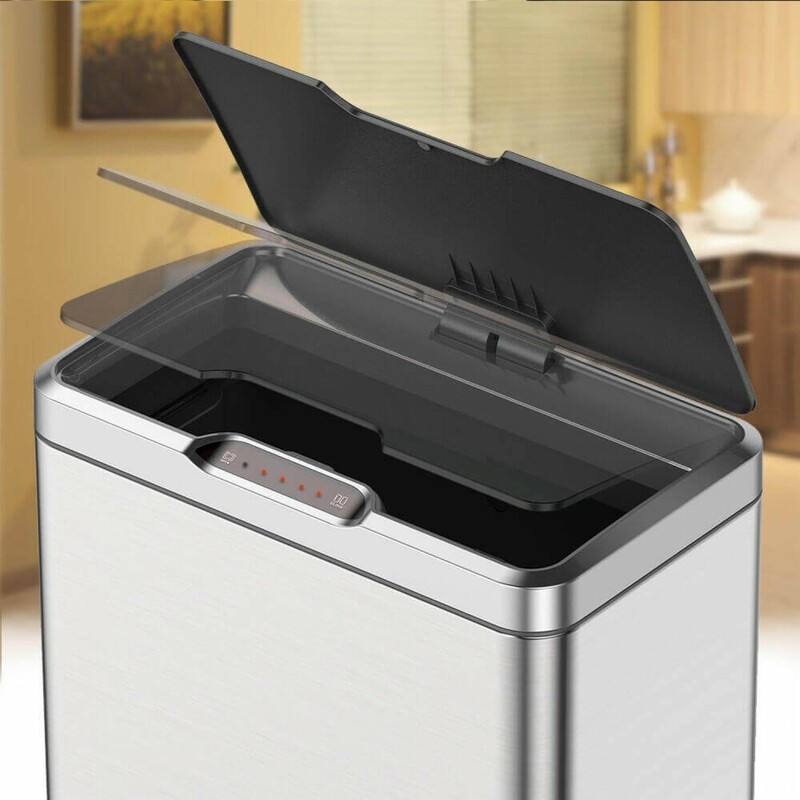 The 40L Mirage double compartment kitchen bin, ideal for family kitchens and people concerned with daily recycling, the automatic sensor bin opens to reveal two x 20L twin buckets, for use with food waste, paper, cardboard, plastic, glass bottles and other recycling needs. Constructed from premium 430-grade stainless steel, offering anti rust corrosion resistance, this motion sensor waste recycling bin is ideal for use in humid kitchen, bathroom and laundry environments. The rectangular design with all 4 sides flat, will sit cozily against walls, kitchen cabinets or at an end of an island. The inner compartments are hardened ABS plastic containers that can be easily removed and rinsed avoiding any unpleasant odours. The Inner Pail buckets also contain a plastic bag fixing hole which allows liner bags to be secured tightly, avoiding that ‘lost liner bag’ and ugly bag overhang scenario. It's a smart waste disposable, which means it helps you keep your environment hygienic, clean and tidy. 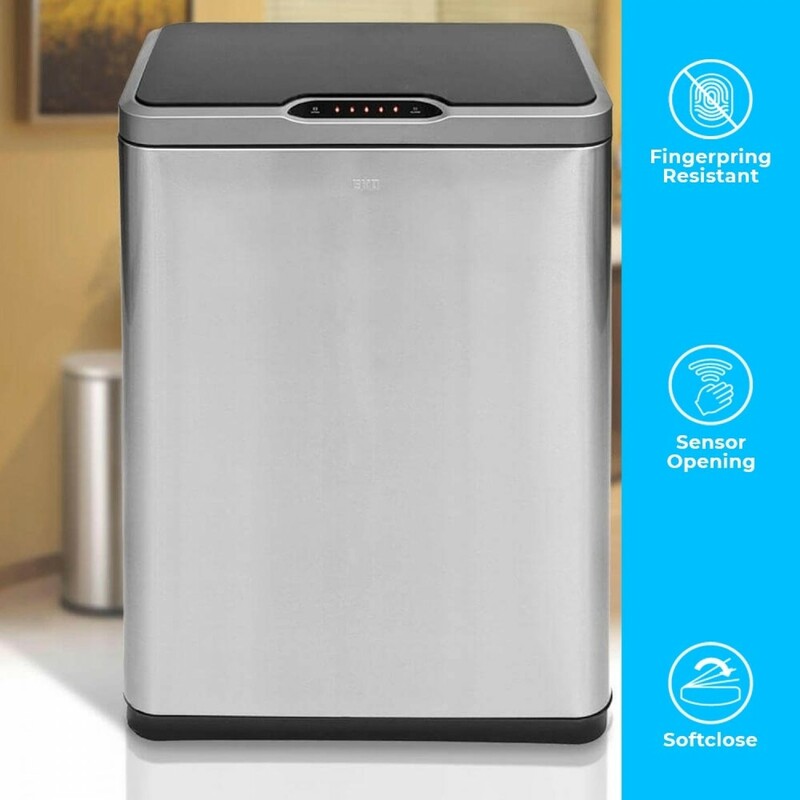 It has has a built-in motion sensor that detects movement and automatically opens the lid of the bin, allowing for hands touch free operation, reducing cross contamination around the home and office environment. The touch switch panel indicates a 5-second countdown prior to automatic soft closing. Should you wish, the double compartment kitchen bin can also be operated in ‘manual mode’ using the ‘open’ and ‘close’ buttons - battery power is still required for this. The motion sensor on this bin requires 6 x AA type of good quality batteries, giving around 20,000 open/close operations. Batteries are not included. All our Autobins uses the latest technology in the dampers on their soft-close lids to give a quality feel. The graduated closing speed, achieves faster closing, without sacrificing the soft-close effect.